Faulty traffic lights at a busy road junction are being blamed for a string of crashes and near-misses. David Ashton, of Worth Park Avenue, Pound Hill, says that traffic lights at the junction of Worth Road and Worth Park Avenue have been working only intermittently for weeks. “They were not working for about four days over the Bank Holiday weekend and I saw a number of near-misses he said. He said the lights had come back on during the week. but by Saturday morning they were not working again. The following day, said Mr Ashton, “there were two further accidents but one was not as serious as the one on Saturday. “Then around 3:30 there was a huge bang. Luckily, no-one was hurt but the cars overturned. “At that time the traffic lights were still not working. He said the lights were repaired by an engineer about an hour and a half after the last accident. 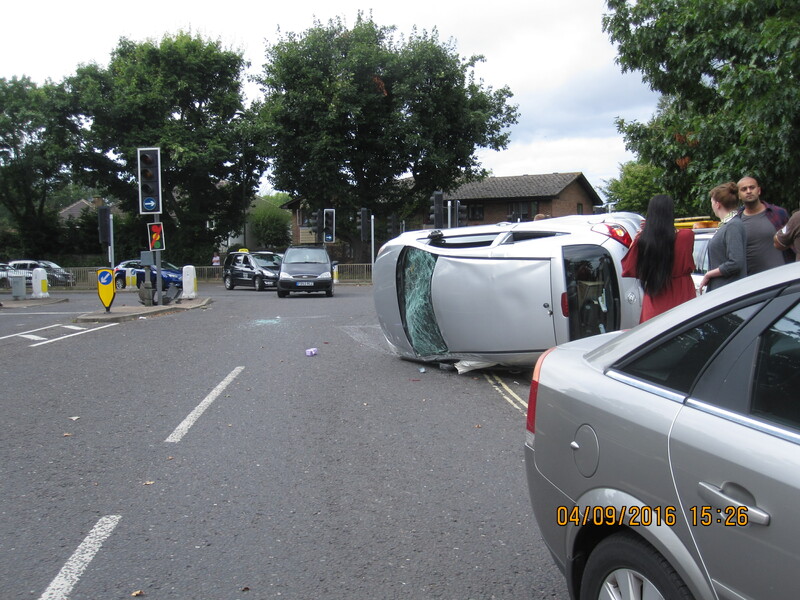 “This is quite a busy junction and it was inevitable that something like this would happen. “it was obvious there was a problem there.” Police later confirmed they had been called to the accident on Sunday afternoon. A spokesman said the crash involved “a Vauxhall Corsa – which had turned onto its side – and a Vauxhall Vectra, occurred at the junction of Worth Road and Worth Park Avenue. have been problems caused by a series of underground wiring faults at the junction, requiring new cables to be installed. “We have isolated the faulty wiring and made a temporary fix, which restored the signals on Sunday. Students at the largest school in town have been breathing some of the worst air in the county. Hazelwick School, in Three Bridges, is situated in one of the most polluted square kilometres of land in West Sussex outside of Gatwick, according to statistics from Defra (Department for Environment, Food & Rural Affairs). The levels of nitrogen dioxide (NO2) being Produced by diesel cars and trucks in the Hazelwick Avenue area was listed by Defra as exceeding 25 tonnes Per Year – the highest pollution category on its map. The NO2 levels, coupled with a high level of Particulate matter in the air, prompted Crawley Borough Council to designate the area as one of only 10 air quality management areas (AQMA) in the county. The others are in Chichester, Cowfold, Hassocks, Shoreham, Southwick, Storrington and Worthing. The responsibility for monitoring air Pollution levels lies with Crawley Borough Council. A spokesman said the air quality was constantly monitored and the borough would be working with West Sussex County Council to deliver traffic calming measures to the area. POUND HILL: A teenage boy suffered life-threatening injuries after he was hit by a silver Volkswagen Polo car in St Mary’s Drive on Saturday just after 4pm. The 15-year-old had just got off a single-decker bus before the collision with the car, which was driven by a 19-year-old woman from lfield. She and the bus driver were both unhurt. Police and an ambulance attended and the boy was airlifted to the Royal London Hospital in Whitechapel, London.He underwent surgery for serious head injuries and has been detained for further treatment.